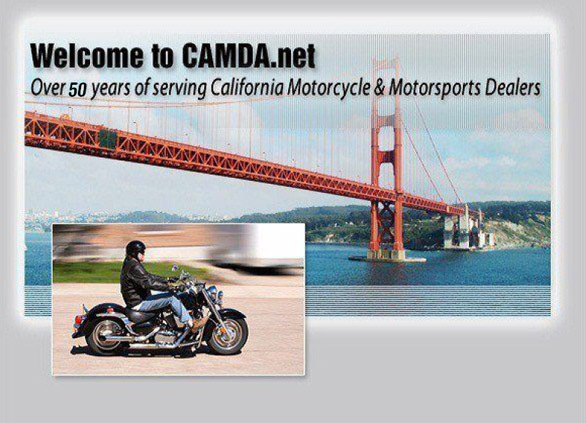 The mission of the CMDA is to promote the Motorcycle and Motorsports Industry in the most positive, professional light for the benefit of California Franchised Dealer Members, consistent with the public interest, franchise equipment manufacturers and the government. The CMDA provides professional support services to benefit Member Dealers and associated trades, in the exchange of business acumen, knowledge, fair commercial practices and cost reduction services to produce improved financial results. The CMDA provides proactive legislative support and lobbying activities on issues affecting the Motorsports Industry. This support takes many forms and involves many activities. Among these are enunciating the needs of dealers and pursuing political action to become as vigilant as necessary to meet these needs. The CMDA works to educate our state legislators and regulatory agencies on the issues crucial to franchised dealers, such as providing general information about our industry, safety and equitable business needs. The CMDA promotes fair and ethical business practices among its Members, employees and customers. The CMDA looks to the future of the Motorsports Industry to influence a positive increase in enthusiastic customers for its Member Dealers to stay financially viable for the long-term to ensure stability and prosperity in our industry. The CMDA and its Member Dealers promote the sport of motorcycling, and in particular the issue of safety, in order to bring more people into the sport.